Clontarf Pumping Station is Stop 6 on the Spit to Manly Walk, as seen in the downloadable Spit to Manly Complete Guide and Map. If walking from Clontarf Beach… At the southern end of Clontarf Reserve, an access road meets the beach. Beside this is a large concrete building that looks a little dramatic for this harbourside setting. This is Clontarf Pumping Station. Clontarf Pumping Station is part of the sewerage connecting to the treatment plant at North Head, Manly. Its ornate art deco design from the 1920s, with a hint of Egyptian Revival architecture, is a most impressive way to pump poo. It was designed by J.J.C. Bradfield, the Chief Public Works Engineer. Bradfield went on to design other more notable Sydney landmarks, such as Circular Quay railway station and the Sydney Harbour Bridge, as seen on the Sydney City Walk. Both this building and its companion across the water at Parriwi Beach, appear on heritage registers for their cultural significance. At low tide you should be able to walk the length of Clontarf Beach from the pumping station to the national park without getting your feet wet. At mid-tide you might be able to walk the beach holding your shoes with small waves lapping up to knee-height. At high tide walk along Monash Crescent, behind the row of beachfront houses. 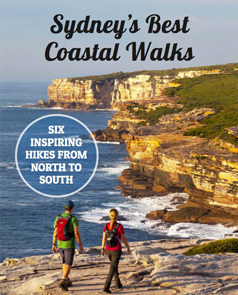 You will then enter Sydney Harbour National Park, with the next stop Castle Rock Beach.